You are here: Home / Nascar News / Who Has the Most To Prove? 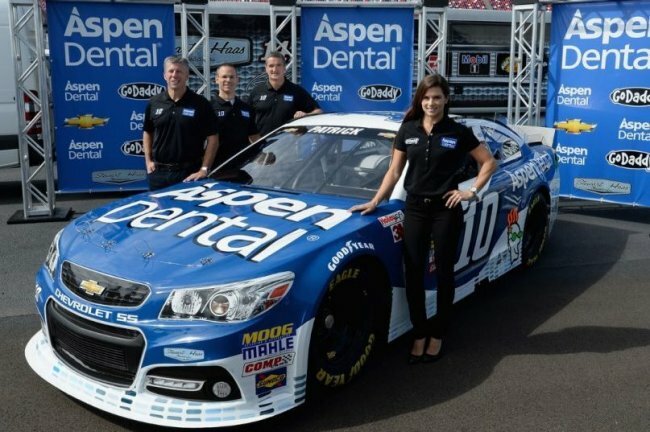 Danica Patrick (centered) shows off her colors for the 2014 season with new sponsor Aspen Dental. She will run this paint scheme at the Las Vegas and Atlanta races. Image courtesy of the Bleacher Report. And NASCAR's short offseason is drawing to a close. Some teams are set and prepared for the start of speedweeks. While new faces, drivers and crew members alike, are finishing up their winter's work for the 10-month grind that awaits them. Every year, February turns into a month of hype as every team gets a new opportunity, a clean slate. Excitement runs down every organization as they believe the new season brings new opportunities – a chance to make the Chase, to win a race and to claim the title. With this hype comes the added pressure. At the beginning of each NASCAR season, all the high-market organizations set standards for their teams and drivers as sponsorships, endorsements, prize money and pride are all on the line. It's fair to say that 2013 was a struggle for Denny Hamlin. After a last-lap tangle with former teammate and rival Joey Logano during the Auto Club 400, Hamlin spun off turn 4 and crashed head-on into an outside, concrete wall. The impact caused Hamlin to suffer a massive L1 Compression Fracture, or a collapsed vertebra which caused him to miss the next four races, effectively ending his bid for a title. Upon his return, Hamlin struggled to show flashes of his former self. Wrecks at Daytona in July and Pocono in August, where Hamlin simply lost control of his car, drew the question if he returned too quickly from his injury. We've seen injured drivers return to the track only to be a shadow of their former self. The two most popular instances have been Steve Park and Sterling Marlin. Park was in contention for his first top-10 points finish in 2001 when a bizarre crash during a Busch Series race at Darlington Raceway caused him to suffer a massive brain injury, along with several broken ribs. Although Park returned in 2002, he lost his ride one third into the 2003 season due to a lack of performance. Marlin, on the other hand, had led the points for the majority of the 2002 season and was in contention for his first title late in the year. That changed during the 29th race of the season at Kansas Speedway. While running in the top 10 mid race, Jeff Burton made slight contact with Marlin's left rear bumper which sent him head on into the turn 2 wall. The heavy hit caused Marlin to suffer a broken vertebra and forced him to miss the final seven races of the season, ending his championship bid. Although he returned in 2003, Marlin finished no higher than 18th points in the next three seasons and was released at the end of the 2005 season. Hamlin needs to prove to his team and the skeptics that this fate won't befall on him. But there is reason to hope. Hamlin won the final race at Homestead-Miami Speedway after starting 5th and leading for 72 circuits. He also finished the season with four top 10s in the final six races, giving him and his team some much-needed momentum. Throughout the offseason, Hamlin has claimed that he feels 100 percent and is ready to content for the title. After enduring a miserable 2012 campaign with Phoenix Racing where track performances were just as poor as offtrack activities, the former Sprint Cup Series champion went through a resurgence last year. Just five races into the 2013 season, Busch showed the NASCAR world his true skill level by getting back-to-back top 5 finishes at Bristol Motor Speedway and Auto Club Speedway for his new team, Furniture Row Racing. Not known as a consistent front-running group, the Denver-based, single-car team showed Chase potential with Busch as their driver. After suffering through some learning curves in the first 11 races of the regular season, Busch and the team began to gel. Throughout the summer months, Busch and his team put a string of eight top 10s in 12 races to put themselves in position to make the Chase for the first time in the organization's history. This potential was placed on hold with three races left in the regular season. On the weekend of the Bristol night race, it had been reported that Busch had been contacted by Gene Haas, part owner of Stewart-Haas Racing, to join his team for the 2014 season. History in the sport has shown that a distraction as massive as this one can be detrimental to a race team, especially one that is in position to make the Chase. And a 31st place finish after a pit crew mistake during the race didn't make the situation any better for the group. Just a few days later it was confirmed that Busch would join Stewart-Haas Racing in 2014 as their fourth entry. With a lame-duck driver at the helm, most teams would typically call it quits. But Furniture Row Racing and Busch stuck together. The group wrapped up the regular season with finishes of 4th at Atlanta Motor Speedway and 2nd at Richmond International Raceway to earn a spot into NASCAR's playoffs. Although they struggled to compete for the title in the Chase, Busch was able to finish 10th in points. This made it the first top-10 points finish for Furniture Row Racing and Busch's first since he finished 4th in points in 2009 while driving for Penske Racing. With a successful 2013 campaign behind him, Busch now faces new challenges. He hasn't won a race since Dover in September, 2011. And with the new points system rewarding winning, Busch must find victory lane sooner rather than later to have a shot at making the Chase. Busch must also be able to gel quickly with his new team, something that he has struggled with in the past. He must also get along with his new teammates, especially team leader and owner Tony Stewart – a driver who Busch has tangled with numerous times in the past. Busch has shown he has talent to be a contender and champion. But with top equipment once again, pressure will be on for him to get the job done. Perhaps, there has never been a driver with the most pressure entering their second season than Danica Patrick. The 2013 Daytona 500 pole sitter had a challenging rookie campaign, to say the least. After leading five laps and finishing 8th in the Great American Race, Patrick failed to record another top 10 finish the remainder of the season. For all the success Patrick enjoyed during last year's speedweeks, she only recorded eight top 20s in the remaining 35 races. In fact, her best finish the rest of the way was a 12th place result at Martinsville Speedway in April. With NASCAR's new point system nearly guaranteeing a driver a Chase spot for winning one regular season race, Patrick does have a chance at making the postseason, especially with three of these races being of the restrictor plate variety. But realistically, Patrick must focus on improving her finishes. She has gotten a full season under her belt with all the necessary laps to understand each track's characteristics. In her second season, Patrick must be able to further analyze what her car needs during races. Because frequent finishes in the 30s will only draw more ire and criticism from fans and the media. Patrick doesn't need to make the Chase to consider this season a success. But she will most definitely need to improve on one top 10 and nine total top 20s during a 36-race season. Those kind of numbers and another 27th place points finish will not sit well with the critics. The former Indy Racing League star has shown that she can wheel a racecar. Now, she needs to show it more consistently. Could there be bigger shoes to fill in this sport? If there is, don't tell Austin Dillon. This year's Rookie of the Year candidate will make his full-time debut in the Sprint Cup Series at Daytona while driving the famous No.3 Chevy for the first time since the 2001 Daytona 500. While that number has made a full-time return in the Nationwide Series and Camping World Truck Series, the No.3 has not hit the track in a points-paying Sprint Cup Series race since Dale Earnhardt lost his life in 2001. When car owner Richard Childress, Dillon's grandfather and boss, made the announcement in December, there were mixed reaction amongst the fan base. Some claimed the No.3 should remain retired permanently as a tribute to The Intimidator. Others were fine with decision, claiming that it was time to see the No.3 back on the track. Whether you are for or against the No.3 returning to the Sprint Cup Series doesn't make much of a difference at this point – the decision has been made. But doubters and critics should take note that the No.3 will not be driven by an average racer. Dillon is an accomplished NASCAR driver. After entering the Camping World Truck Series full time in 2010, Dillon won two races, finished 5th in points and captured Rookie of the Year. The following season he won two more races and won the championship. After winning the title, Dillon moved up to the Nationwide Series in 2012. In his rookie campaign, he won two races, finished 3rd in points and won Rookie of the Year. He backed that performance in 2013 by winning the Nationwide Series championship despite failing to win a race – this marked the first time in any of NASCAR's three national series that a season champion went winless. All these accolades should easy some of the doubt about Dillon for the time being. But a poor rookie campaign will quickly refuel that fire as some will claim the Dillon was never the right man for the job. Like Danica Patrick, Dillon doesn't need to make the Chase for him and his team to consider this season a success, it is his first full season in NASCAR's toughest division. He just needs to show steady improvements with each passing race, especially after hitting tracks for a second time. Solid finishes throughout the season, even if he goes winless, will show drivers, fans and the media that he is the real deal. It's hard to believe that anyone can enter the 2014 season with more pressure than Austin Dillon. But Kevin Harvick is that man. After admirably filling the seat for Dale Earnhardt in 2001, Harvick completed a 13-year tenure with Richard Childress Racing where he won 23 races and finished 3rd in points in three of the past four seasons. Despite their success together in the past few years, it can be argued that an end to this marriage was inevitably coming. The first cracks in this relationship began to surface in the mid-way through the 2009 season. For RCR, 2009 was a miserable season. All three drivers missed the Chase while going winless for the first time in the organization since the 2004 season. To add fuel to the fire, multiple reports stated that Harvick, who was mired deep in the points standings, asked for a release of his contract at the end of the 2009 season to secure a ride at Stewart-Haas Racing for the 2010 season with the intentions of bringing his then-sponsorship of Shell-Pennzoil with him. When later asked during the season, Childress stated that Harvick and Shell-Pennzoil would be on the team for the 2010 season. While the organization's performance improved during the last third of the season, Harvick still finished a disappointing 19th in the points standings, his worst finish since his sophomore campaign in 2002 when he finished 21st in the standings. Despite finishing 3rd in points and recording a total of seven wins the following two seasons, Harvick still remained frustrated with the organization for its inability to win a title. The final straw was laid in 2012 when on the weekend of the penultimate Chase race at Phoenix International Raceway Harvick announced that he would be leaving RCR at the conclusion of the 2013 season to finally join Stewart-Haas Racing. Ironically, Harvick won the race two days later. After fighting valiantly with his team last year, Harvick is starting a new chapter in less than three weeks. With that said, he has the most pressure of any driver out there. For years, Harvick wanted out of RCR to move to SHR. In the last few years, he has questioned the direction that his former organization was headed, mostly noticeably after last year's Martinsville tirade when he tangled with Ty Dillon, Austin's brother and RCR driver, during a Camping World Truck Series race. Well, he finally got his wish. He is in top-notch equipment, one that recently won a Sprint Cup Series title in 2011. And he is also driving for his close friend, Tony Stewart. It's fair to say that if he and his team are not in the title fight at the Homestead finale, this season could be considered a failure. Harvick needs to prove to everyone, including himself, that he made the right decision by leaving an organization that jump-started his career – one that helped him win 23 races and finish 3rd in points in three of the last four seasons. This time around, Harvick has no excuses. It's put up or shut up. Great article! I agree it is time for some drivers to step up. I think Denny Hamlin will be just fine, after winning the race a few years ago at Martinsville coming off a torn up knee he proved he has the skills to drive a car. I just noticed 3 out of your 5 drivers are at Stewart-Has racing.